Ever since Portal lit the gaming world ablaze in 2007, first-person puzzle games have emerged as an indie gaming staple. 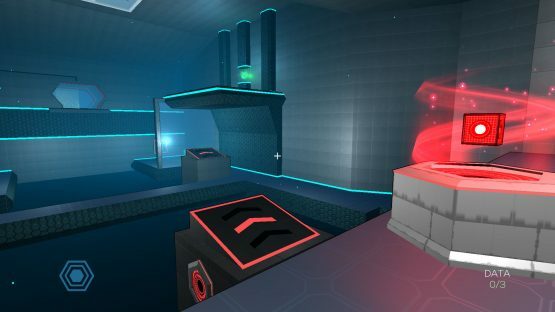 There are dozens of games that attempt to build upon its test chamber format, with notable successes such as Q.U.B.E. and Quantum Conundrum. The latest puzzle game that’ll attempt to stump players is Bluebutton Games’ Polarity: Ultimate Edition, an enhanced port of their 2014 PC release. The main mechanic of Polarity has players switching between two different colors: red and blue. When the character is red, they can go through red beams without taking any damage, and if they want to walk on a red surface (rather than fall through it), they’ll have to switch to the opposite color. While this clearly isn’t the coolest puzzle mechanic to date (it won’t leave you amazed like the first time you rewound time in Braid), there’s just enough meat here to base a game around it. To complement the constant switching of colors, the game also has plenty of orbs that players will have to use to solve puzzles. These are used to open doors and turn on other devices that’ll make progress possible. One of the coolest examples are jump pads that’ll send the player flying through the air when powered on. This sort of first-person platforming can feel awkward at times, especially when the game required me to hit several jump pads in a row, but thankfully checkpoints are plentiful and there’s no real punishment for messing up a jump. 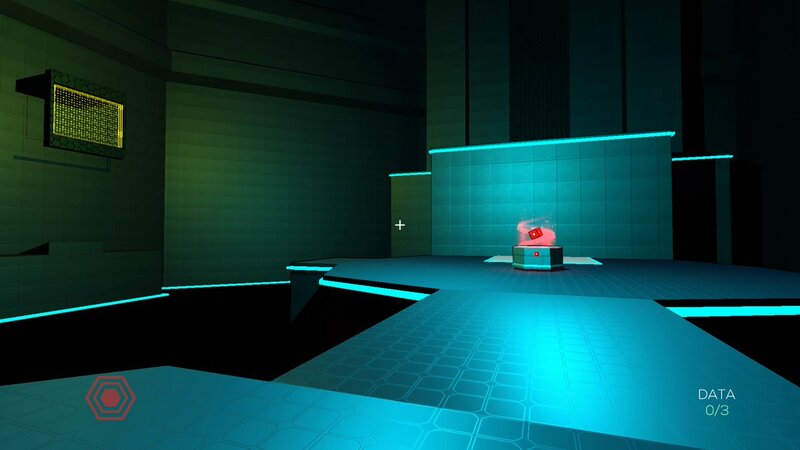 Essentially, Polarity has all of the tools in place to make for a great puzzle game. The problem is that it never manages to take off during its 37 levels. The puzzles never become difficult, with the later levels rarely testing my mind or reflexes. Rarely did puzzles ever elicit more than a “that was neat” reaction, and I breezed through the game in about two hours. It would’ve taken an even shorter amount of time if it wasn’t for the game’s archaic progression system, which forces players to collect a ton of collectibles. Thankfully this isn’t too much of a hassle, as the collectibles are relatively easy to find, but having to replay levels that weren’t exactly mind blowing the first time around is a drag. After I hit my first wall in terms of progress, I made sure to look for each of the three collectible data orbs in each level, and I was able to finish the game without having to replay major chunks. Another bummer comes in the form of Polarity‘s story, which involves stealing data from banks and other corporations. It’s a cool concept, and one that games have toyed with in the past, so it’s implementation is completely underwhelming here. All in all, the story is told in three or four screens of text, giving little more than an outline of events rather than telling a solid story. Much like the rest of the game, it takes a good concept and then doesn’t do much with it. Beyond the game’s solo mode, Polarity: Ultimate Edition also offers up a two-player cooperative campaign. It’s slightly shorter than the main game as it clocks in at only 15 stages, although it manages to artificially lengthen itself by forcing players to find all of the collectibles if they want to finish the campaign. This makes the puzzles slightly more interesting than before, as the game can play with trapping individuals and separating the two players. It’s a solid addition, even if it the core gameplay isn’t built around cooperation. The other major mode, which comes in the form of competitive multiplayer, isn’t nearly as compelling. This mode has players in separate roms where they’re supposed to throw cubes at their opponent’s pads while avoiding lasers. This rather unremarkable mode lasts only a minute, and I didn’t want to go back to it after the first round had ended. I can’t imagine inviting a friend over just to play this when games like Lethal League and Towerfall are just a few clicks away in my PlayStation 4 library. What really hurts both of these modes is that they are local-only. That means players have to deal with a split-screen view that makes it more difficult to see the surrounding areas. It’s worth noting that with Share Play, PS4 owners can still play the co-op campaign online, but they’ll have to deal with their screen cut in half. Either way, the experience isn’t great here. Despite never playing the PC version of Polarity, I couldn’t quite shake the feeling that I had seen everything that the Ultimate Edition had to offer. While the puzzles are all well thought out, there isn’t anything that’ll be remotely challenging for gamers that have completed Antichamber or Portal. The lack of complexity is paired with a disappointingly short experience that brings absolutely nothing new to the table for first-person puzzle games. It’s not bad, but it’s certainly forgettable. Review code for Polarity: Ultimate Edition provided by the publisher. Reviewed on PS4 Pro. For more information on scoring, please read our Review Policy here.